​1. Place pistachios, sugar and cinnamon in a food processor and pulse until coarsely chopped. Set aside. 2. To make the syrup, add honey, sugar, lime zest, cinnamon stick and 110ml water to a small saucepan, set over a medium heat, stir to dissolve sugar. Bring to the boil then simmer on low heat until the syrup is thick enough to coat the back of a spoon (about 10-12 minutes). 4. Place filo pastry one at a time on a chopping board and cut into 5cm squares. 5. Brush a square with melted butter. Set another square on top at a 45 degree angle and apply more butter. Repeat again with a third square and apply butter again. Transfer the three layers into a 24-hole mini muffin tin, gently pressing the pastry into a hole. Repeat to fill all the holes. 6. Fill each pastry case with a tablespoon of ground nuts, place in the oven and bake for about 12 minutes, or until the pastry is crisp golden-brown. 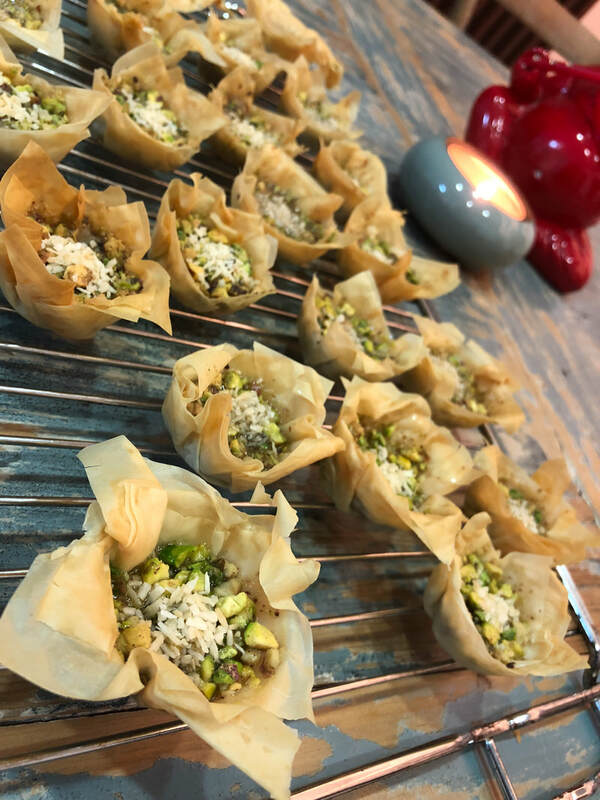 Transfer baklava bites on to a wire rack. 7. Pour 3/4 tablespoon hot syrup on each baklava bite. Garnish with a sprinkle of toasted coconut flakes.